Researched and contributed by Marc McInnes from the original magazines. 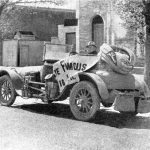 After a 6,000-mile tour of Victoria, New South Wales and Queensland in a Buick motor car, Mr. H. Davy has returned to Melbourne. Mr. Davy began his tour at Mildura last June, and came to Melbourne. Then he travelled on to Sydney. After a short holiday there he left for Brisbane in August, and had an uneventful trip, calling at Toowoomba and Ipswich. 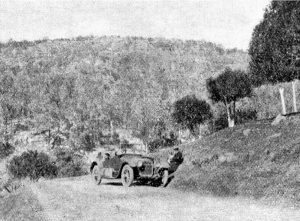 An overland motorist who arrived from Victoria during the month, is Mr., H. Davey, who came through from Mildura to Brisbane in his 1916 Buick, the total distance covered being 2,000 miles. Mr. Davey remained in Brisbane a few days and has since left by road for Blackall where we understand he intends to reside. 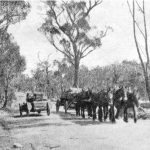 “I left Mildura at 10 a.m. on Friday, arriving at Euston, 6o miles, in 2 & 1/2 hours. From here through Balranald to Swan Hill, where we stayed the night, leaving at nine next day for Echuca. We covered the first 300 miles in just under 13 hours over very bad sandy roads. The next 57 miles to Bendigo took 2 hours; the following 43 to Kyneton 2 hours 10 minutes. From here I had a good run right into Melbourne, covering the 57 miles in one hour 30 minutes. After leaving Melbourne I struck some bad roads and ran through the ‘glue pot’ in the dark. The road was very bad as there had been heavy rains. From Wangaratta to Albury the road was good. Except for a few showers I had a splendid run to Yass, thence on to Bowral. Here I was advised to give up the idea of going any further as it had been raining for about a week. 1 was told it was impossible to get beyond Picton. At any rate I made the attempt; the roads were very bad and for miles I was running in ruts 10 inches deep and then in very soft mud and water. Several times I had to stop and clean the lamp glasses as the mud became so thick on them that they gave no light. I arrived in Sydney however just at mid- night. From here the roads were good as far as Tamworth. Eighteen miles further we had to ford a very bad creek, but the car took it well. Towards dusk rain set in and from Guya we had a very bad road and heavy rain. The town clerk told us it had been raining for 11 weeks, but we managed to get through to Glen Innes that night. Sunday’s run was a short one to Tenterfield. The next day the run to Stanthorpe was good and from there to Warwick the roads were extremely rough. We had some very heavy pulling on the black soil, sinking axle deep at times. We spent the night at Clifton it being impossible to drive on account of the heavy rains. Our next day’s run took us to Ipswich, and the following morning we ran into Brisbane. On the trip we added only one gallon of lubricating oil. The car was driven 6,000 miles before any oil was added to the differential, I have been 6,500 miles with one puncture, and the other three tyres haven’t had a pump on them. The Buick came through without the slightest mechanical attention. He then set out for Dalby, and found the roads in fairly good condition. Continuing on to Chinchilla, he encountered bad roads, and had trouble with his tyres. Near Yeulba the road became even worse. It was studded with gilgi holes, and the car became bogged several, times. These water- holes were often 20ft. across, and, owing to the thick prickly pear on either side, it was impossible to drive around them. It took five hours to travel 12 miles. The next stopping place was Roma, which is a big trading centre. At Muckadilla, Mr. Davy saw an interesting artesian bore, which has been taken over by the Queensland Government. The mineral waters thrown up from the bore are said to contain medicinal ‘properties, and rheumatic patients travel far to take treatment there. The Government institution employs a trained nurse. The journey was continued on to Longreach, where.Mr. Davy spent much time travelling around the neighbouring stations. It was early in October when he left Longreach for Blackall, which is about 140 miles distant, through Portland Downs, which is beautiful pasture land, and is covered with an abundance of grass. From Blackall he went past Tamboo and Charleville, which is nearly 200 miles distant. Myriads of mosquitoes were here, and made camping out a most disagreeable experience. Then followed a journey of 140 miles along the Warrego River to Cunnamulla. This is very sandy country, but in October there was an abundance of food everywhere. The Queensland border was crossed at a place called Barringun, and from there the route was followed to Bourke, 170 miles away. Approaching Bourke there is a difference in the country. The soil is more of a sandy nature, and there are more trees. 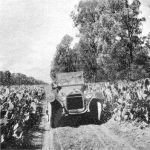 Bourke, which was once a flourishing township, had quite a delapidated appearance, and business seemed to be at a standstill. From here Mr. Davy travelled south to Cobar. For the first 50 miles the roads were particularly good. He describes them as being as level as a billiard table. The change in the appearance of the herbage and timber was most noticeable. Mr.Davy says that the grass in New South Wales is finer and more nourishing than the Queensland grass, which is coarse and grows to a great height. This coarse grass, however, appeared to be very fattening, as the stock passed in Queensland were in excellent condition. The general air of prosperity at Cobar impressed him very much, many of the mines which had been closed down having been re-opened. This is a country of great distances, and the next run was over 164 miles to Hillston. The journey was then continued to Gilgunnia and round Mount Hope. Rains had made this country very rough, and the abundant growth of grass made it mpossible to distinguish the track. It was remarkable that this rich country was poorly stocked. Mr. Davy had to cross several flooded creeks and was often bogged. On occasions he had to borrow horses to pull the car out of difficulties. In one place the car became badlv caught in the mud, but fortunately the teamsters with passing wagons came to his assistance. It took nine horses to pull the car out. A wool wagon also crossed the creek at this spot. It carried a four ton load, and it took 32 horses to do the job. The road right on to Hay was beset with similar difficulties; but the car was still in good condition when that town was reached. From Hay to Deniliquin the distance is 77 miles, and all communication by car had been cut off for several weeks, owing to the bad state of the roads. The Buick however, ploughed through and left a track for the whole distance of about six inches deep. Melbourne was reached by way of Echuca, Rochester and Bendigo. Mr. Davy says that the self-starter gave no trouble, and the lights always burned brilliantly. The average petrol consumption for the whole trip was 21 3/4 miles to the gallon, and a gallon of oil averaged about 1300 miles. Fully equipped with camp material and other necessaries, the car’s weight was 30cwt. Between Wallangarra and Stanthorpe Q. Through the Prickly Pear. Buick Car near Chinchilla, Q.